Cheese and Broccoli Pie isn’t really a pie at all. It’s more like a calzone to be honest. 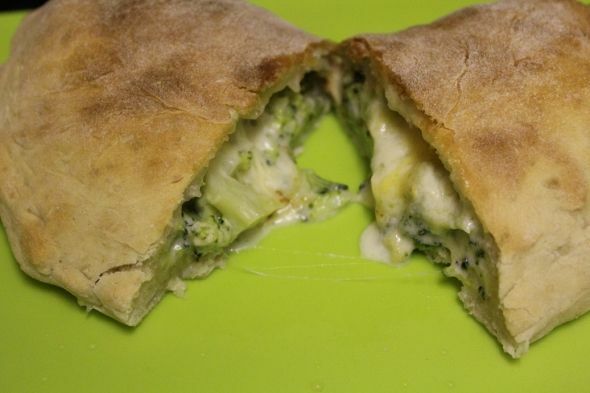 A calzone filled with healthy delicious broccoli and an abundance of calorie filled, flavorful, comforting, wonderful cheese. They can be eaten hot or cold and make great picnic lunch fodder. Below I have outlined the fairly simple step by step process that I use to make my pies accompanied by photos to help you along on your way to making your own. If you try this recipe please stop back and let me know how it went! To make the dough you must first combine the sugar with the yeast in the warm water. Leave it to wake up for about 10 mins in a warm place. You should notice that the yeast will bubble and foam, this is what you want to see! Next combine the yeast mixture with the flour and the garlic infused olive oil and then knead the dough for 10-15 minutes with a sprinkle of extra flour if the dough is too sticky. 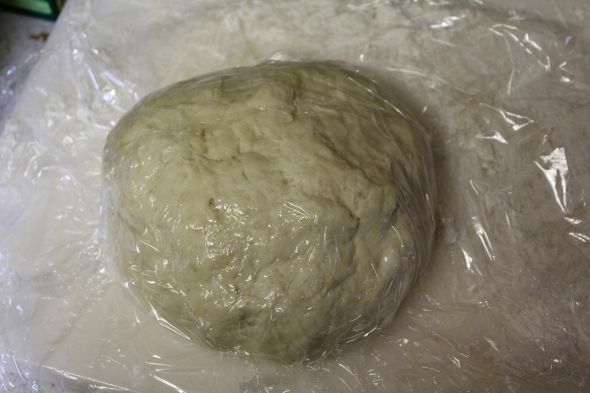 Cover the dough ball and leave to rise (preferably in a bowl) for about 30 minutes. While the dough is rising you have plenty of time to make the filling. First chop the broccoli into small pieces (none larger than a penny). 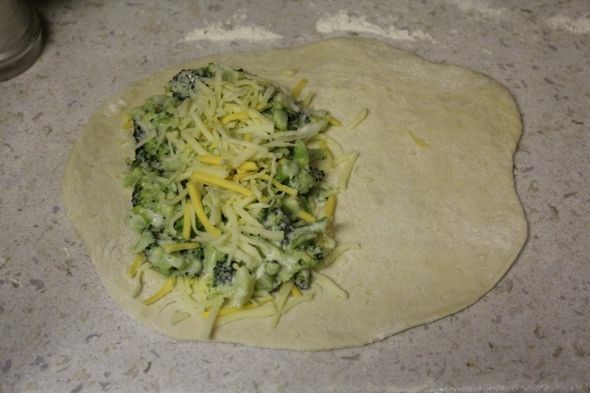 You should have approximately 5 cups of raw broccoli which will make four pies with the amount of dough in this recipe. 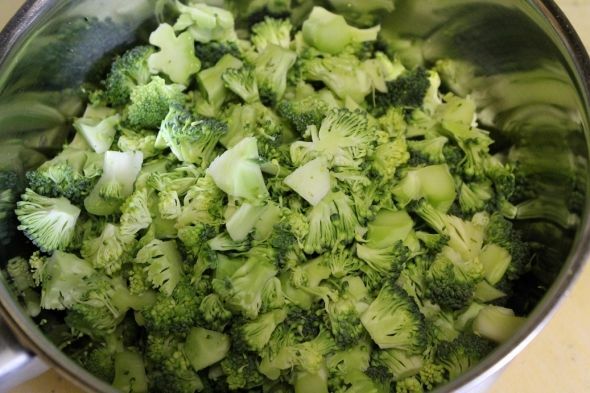 Boil the broccoli until it’s tender in enough water to just cover the tops. The texture is up to you. I prefer my Broccoli to be soft but still maintain a bit of snap. I would advise against steaming the broccoli because you risk it turning to wet much which, although delicious isn’t really right for this recipe. If you have never boiled broccoli before it shouldn’t take very long at all before it’s cooked so test it after a few minutes and gauge from there. Toss in the black pepper and salt. Stir until blended and then gradually add in half of the mozzarella and half of the cheddar. 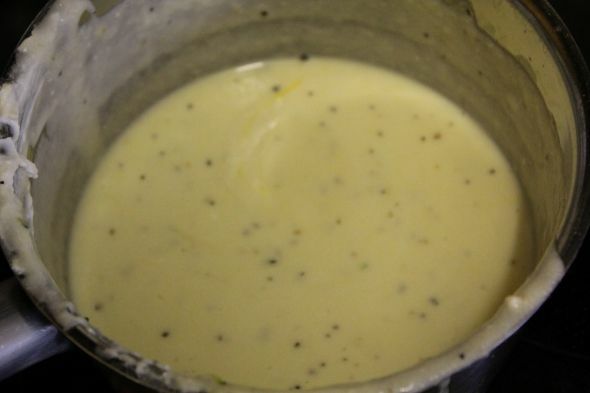 Continue stirring until the consistency changes to that of a thick sauce. 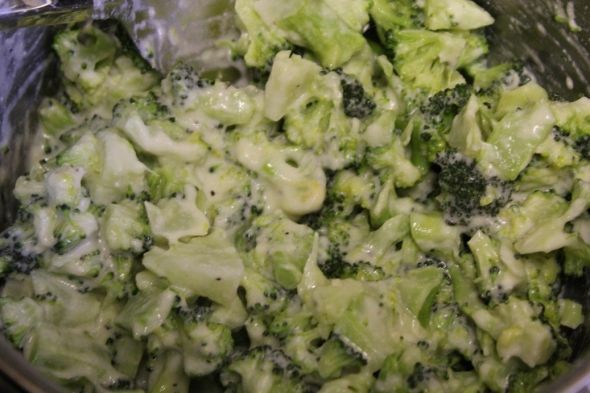 Make sure that your broccoli has been thoroughly drained and combine the cooked broccoli with the sauce. 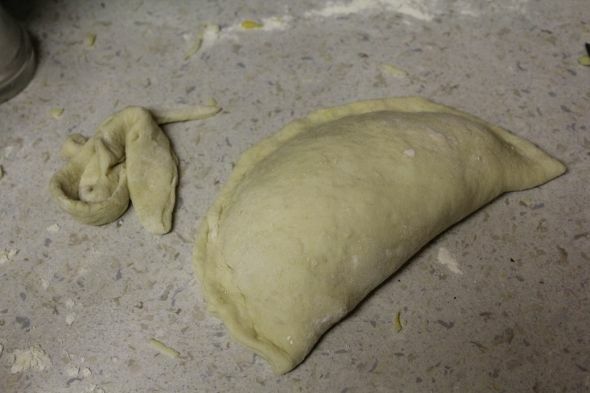 Punch down risen dough (don’t panic if it hasn’t risen all that much) and divide it into four equal pieces. 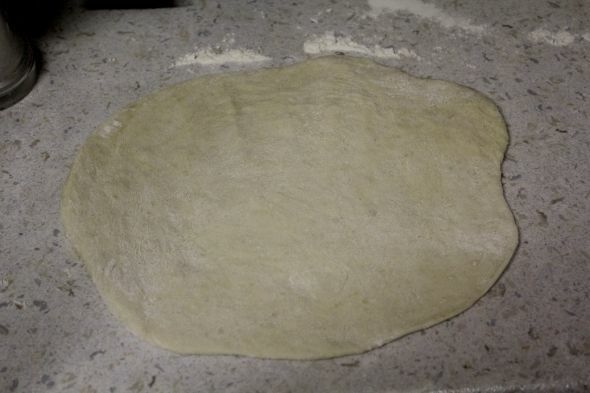 Use a rolling pin to roll out the first dough ball as in the photo below. 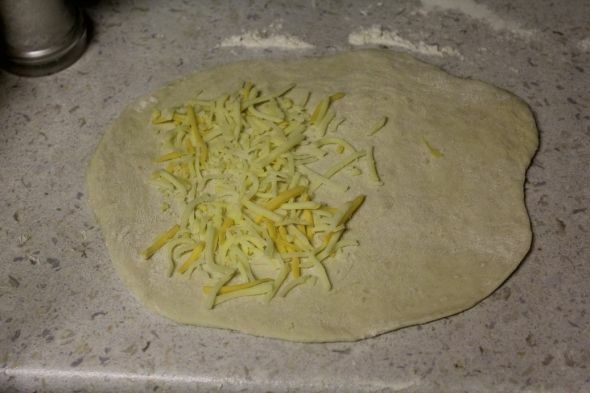 Lay down a generous layer of mixed cheddar and mozzarella cheese on half of the rolled dough. 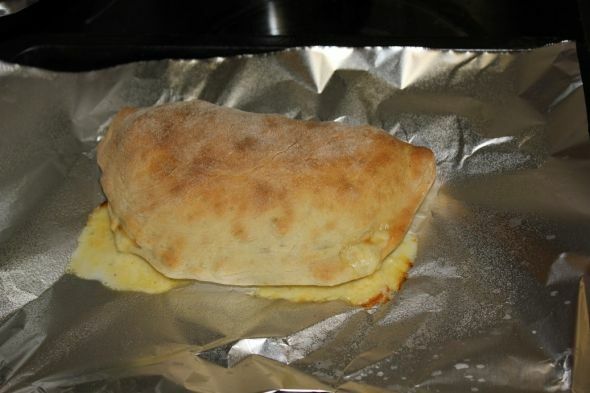 Add a nice big scoop of filling on top of the cheese and sprinkle on some more cheese. 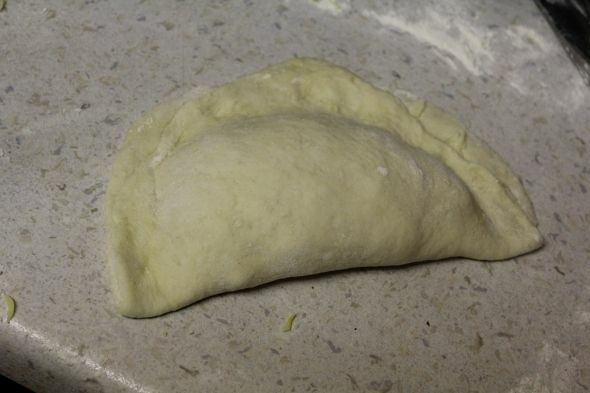 Fold the free side of the dough over to meet the spot just where the filling begins. Press the edge down toward the counter top with your fingers and try to ensure there aren’t any air bubbles trapped inside. Now that edge is far from perfect so you can just chop away the extra dough to make it pretty and Repeat the pie making process 3 more times with the remainder of the dough and filling. Preheat your oven to 180c or 350f and place the pies on a greased baking sheet. Bake for 20-30 minutes until the top of the pies are crusty (if you tap them they should be hard and will make a hollow sound) and browned. For me these are a food to be eaten wrapped in a napkin in your hand but you can serve them up any way you wish. They’re tasty hot or cold! The pies will reheat beautifully in the oven. If you put them in the microwave the dough may go a bit chewy but it will still be delicious!